Although Bike Fun with PPSP will continue into October, this Wednesday will be the last 2014 opportunity to join in on the monthly Poky Pizza Pedal. The first three have been wildly popular, so Poky Pedalers won’t want to miss out on this year’s final pizza-themed ride. The Poky Pizza Pedal is at 5:15 PM on Wednesday August 13. 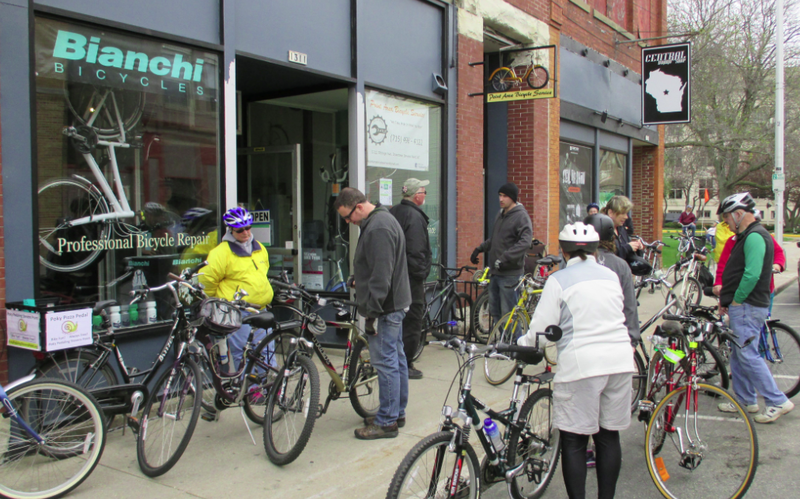 We’ll meet at Point Area Bicycle Service, located at 1311 Strongs Ave (between Main and Clark, one block south of Shopko) in downtown Stevens Point. John, the ace mechanic and all-around nice guy at PABS, will gleefully pump some air into your tires at no charge. From there, we’ll set off on a 4-mile urban loop on calm streets and non-motorized paths. We’ll end at a downtown pizza place close to our starting location where we’ll share food, beverages, and the company of Poky Pedalers. There will be other food options besides pizza for those so inclined. If you are planning on eating pizza, cash is most convenient for paying for your pizza and beverages. Poky Pedalers who don’t want to eat or drink anything are welcome to simply sit and socialize. Bringing a lock to secure your bike while we’re eating pizza is a good idea. We’ll make do with whatever bicycle parking options we have. If you don’t have a lock, I’m pretty sure another Poky Pedaler will be happy to lock your bicycle up with theirs. As always, the Poky Pizza Pedal is free and all Poky Pedalers are welcome. If you want more info about what Poky Pizza Pedals are all about, you can read this webpage. The Are Poky Pedals Family Friendly? page is another place to learn what to expect on any Poky Pedal. The weather forecast for Wednesday shows sunshine and temperatures in the mid-70’s. It looks like another pleasant day for our last Poky Pizza Pedal for 2014. There will be lots more Bike Fun with PPSP after Wednesday, including the Bike/Ped Plan Vision Ride in August, the Influential Citizen Ride in September, and the Maple Ride in October. The 2014 Bike Fun Calendar has info about these and more. But there won’t be another Poky Pizza Pedal until next May, so Poky Pedalers will want to make a point of showing up on Wednesday. I look forward to sharing Bike Fun with you then.